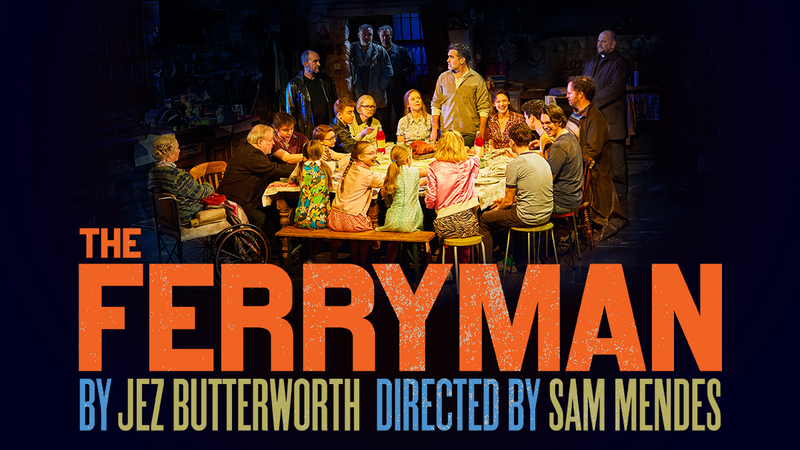 Purchase tickets to The Ferryman online, at the theatre box office, or by calling 212-239-6200. The Bernard B. Jacobs Theatre (formerly the Royale) was originally built in 1927 by real-estate magnates, the Chanin Brothers, as part of a three-theatre complex that also included the Majestic (a large musical house) and the Theatre Masque, now the John Golden (a small house). The three theatres enabled producers to move shows based on their ticket sales to the most appropriately-sized venue. In 1930, the Chanins transferred ownership of all three houses to the Shuberts. 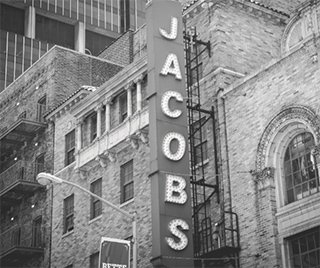 During the Depression, control of the Jacobs passed to John Golden, who renamed the theatre after himself and ran it from 1934 to 1936. The Shuberts regained control in 1936, restored its name to Royale, and leased it to CBS as a radio studio until 1940. It was renamed the Bernard B. Jacobs in 2005 to honor the president of the Shubert Organization from 1972 to 1996. 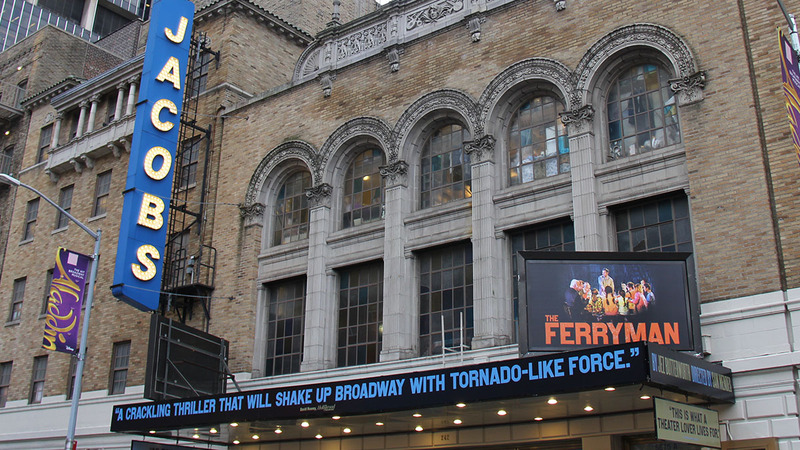 The Ferryman is currently playing at the Bernard B. Jacobs Theatre. The Bernard B. Jacobs Theatre has 1,092 seats and is one of the Shubert Organization‘s 17 Broadway theatres. The Ferryman is recommended for ages 10 and older. Children under the age of 4 will not be permitted in the theatre. A wheelchair-accessible restroom is located on the Orchestra level. Additional restrooms are located down one flight of steps (20 steps). The theatre is not completely wheelchair-accessible. There is one (unisex) wheelchair-accessible restroom located on the Orchestra level. Mezzanine location: Located on the second level, up three short flights of stairs (29 steps). Once on the Mezzanine level there are approximately two steps up and down per row. Reservations are not necessary. Driver’s license or ID with printed address required as a deposit. Please e-mail [email protected] or call: 212-582-7678 to reserve in advance. An Induction Loop is also available at this theatre. The Bernard B. Jacobs Theatre provides at least 10 infrared assisted-listening devices for every performance at the theatre. Beginning four weeks after a show’s official opening-night performance, at least 10 audio description devices are available for every performance at the theatre. In addition, there is unlimited access to downloadable audio description software for personal mobile devices, available beginning four weeks after a show’s official opening-night performance, which provides an automated detailed account of the visual of the production, free of charge, for blind or partially sighted patrons. The theatre also offers handheld devices and software that provide captioning for deaf or hard-of-hearing patrons, available beginning four weeks after a show’s official opening-night performance. Additional devices can be available with at least 24 hours’ notice by contacting Shubert Audience Services at 212-944-3700 or [email protected]. There is also a representative at the Shubert Audience Services kiosk at every performance to assist any patron with the audio description devices, software, or captioning devices. On May 9, 2005, the former Royale Theatre was officially renamed the Bernard B. Jacobs in honor of the late president of the Shubert Organization, who held the position from 1972 until 1996. Originally opened in 1927, the Royale was rechristened the Golden in 1934 and served as a radio theatre from 1936 until 1940, when the Shuberts reacquired it and restored it to the Royale. Recent productions: Bandstand; Cynthia Erivo in the Tony-winning revival of The Color Purple; the star- studded revival of It’s Only a Play; Once; The Mountaintop with Samuel L. Jackson and Angela Bassett; That Championship Season; Bloody Bloody Andrew Jackson; God of Carnage; 13; The Country Girl; Rock ’n’ Roll; Frost/Nixon; Martin Short: Fame Becomes Me; Julia Roberts in Three Days of Rain; Glengarry Glen Ross; ’night, Mother; A Raisin in the Sun; Anna in the Tropics; “Master Harold” … and the Boys; Ma Rainey’s Black Bottom; Jackie Mason: Prune Danish; Billy Crudup in The Elephant Man; John Leguizamo’s Sexaholix … a Love Story; One Flew Over the Cuckoo’s Nest; and Copenhagen. The 1990s saw The Price; Art; Triumph of Love; Skylight; Inherit the Wind; An Inspector Calls; The Kentucky Cycle; and Conversations With My Father. The 1980s included Lend Me a Tenor; Speed-the-Plow with Ron Silver (Tony Award), Joe Mantegna, and Madonna; Caryl Churchill’s Serious Money; Broadway, a revival of George Abbott and Philip Dunning’s 1926 play on the occasion of Abbott’s 100th birthday; Song & Dance, with a dazzling Bernadette Peters (Tony Award); Rosemary Harris in Pack of Lies; Home Front, starring Carroll O’Connor and Frances Sternhagen; Kipling; a musical version of William Saroyan’s The Human Comedy; Joseph and the Amazing Technicolor Dreamcoat; Anne Bancroft and Max von Sydow in Duet for One; and Mary Tyler Moore in Whose Life Is It Anyway?, in which she played the role originally acted by Tom Conti. From 1972 to April 13, 1980, Grease played 3,388 performances. Other 1970s hits were Robert Marasco’s Child’s Play with Ken Howard (Tony Award), Pat Hingle, and Fritz Weaver (Tony Award); and Michael Weller’s Moonchildren. Highlights of the 1960s: From the Second City with Alan Arkin, Barbara Harris, and Paul Sand; The Night of the Iguana, starring Margaret Leighton (Tony Award), Bette Davis, Alan Webb, and Patrick O’Neill; Lord Pengo, starring Charles Boyer, Agnes Moorehead, and Brian Bedford; Coral Browne and Keith Michell in The Rehearsal; Frank D. Gilroy’s Pulitzer Prize winner The Subject Was Roses; Jason Robards Jr. in Hughie; Lauren Bacall in Cactus Flower; and The Man in the Glass Booth, starring Donald Pleasence and directed by Harold Pinter. Past hits: La Plume de Ma Tante (1958); Laurence Olivier in The Entertainer (1958); The Matchmaker (1955); Julie Andrews in The Boy Friend (1954); Geraldine Page, Louis Jordan, and James Dean in The Immoralist (1954); Eartha Kitt in New Faces of 1952; Gypsy Rose Lee in DuBarry Was a Lady (1940); and Mae West in Diamond Lil (1928).